Merry (belated) Christmas and a Happy New Year! I hope you had/have a peaceful and joyful time. The Christmas feast chez Arney. Impressive veggie pie at the back, rib of beef being mauled by my dad in the foreground. I am off-camera to the right, having a nervous breakdown. This year managed to simultaneously produce the best and the most stressful Christmas ever. On the stressful side, I had agreed to cook Christmas lunch for 8 people. It didn’t seem so daunting back in September when I suggested it, even though we don’t have 8 chairs in the house so someone would have to end up sitting on my cajon. Although I’m a competent baker I’ve never actualy cooked a roast dinner before, let alone a roast rib of beef for 8 with all (and I mean all) the trimmings – potatoes roast in goose fat, roast parnsips and chantenay carrots, sprouts, stuffing, pigs-in-blankets and proper red wine gravy. Oh, and a token posh veggie pie for the token posh vegetarian. But being a good scientist, I worked out a protocol with careful timings, including little diagrams to show how many tins and trays would fit in the oven at any one time, and I got through it. Dinner appeared an hour late, but it was delicious – and my first ever yorkshire puddings rose to astronomical heights. The other thing adding to the stress was that it was the grand meeting of the parents – my set of loud, chaotic, beloved progenitors meeting Ricky’s dignified, reserved Dad and his equally charming, dignified wife. 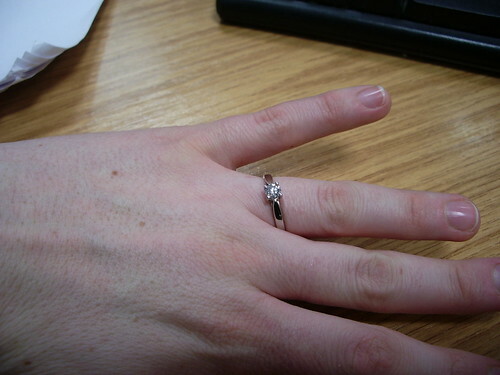 Luckily, we broke the ice with some good news to tell them all – we have got engaged! This entry was posted in Cakes etc, General bimbling. Bookmark the permalink. Congratulations! That’s a nice ring! 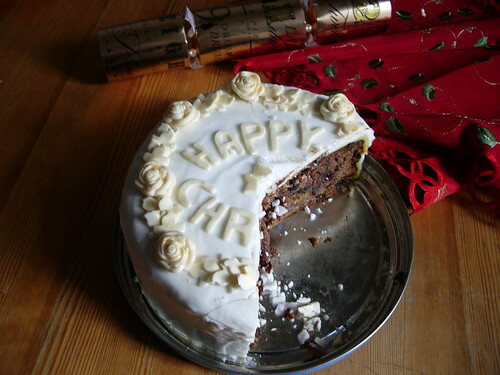 And the cake looks wonderful (completely jealous, I’m the only one in our family in the US who likes christmas cake and making my own (which can cost $150 as the ingredients are hard to get) means it could take me until next christmas to eat it. Congratulations Kat! Ricky’s one lucky boy. My wife and I kept our “Meeting of the Parents” until we were engaged also, so I think you made a good move there. I’m a long time fan of the Naked Scientists and stumbled across your blog here. I’ll be looking forward to reading my way through from your oldest posts to the newest posts so hopefully I’ll be up to date in a month or two. Nice work on your Christmas dinner for 2009/2010, and I hope everything goes wonderfully for you both.